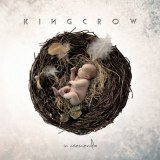 Hailing from Italy and already five albums and seventeen years into their career without my having heard of them, Kingcrow plays a form of prog metal that initially sounds like a very modern form of Dream Theater – all catchy groove and emotion-laden vocals. This is the kind of prog that is driven by the songwriting rather than the keyboard solos, yet the band’s technical skills are still clearly apparent. Pain of Salvation is an obvious touchstone, as are Porcupine Tree and Riverside; it can often seem like Kingcrow struggles to make In Crescendo an original listen. For example, if you’re a Porcupine Tree fan then you will raise an eyebrow at The Drowning Line, which borrows just a bit too much from the British band’s earlier hits. Still, at least bands aren’t just ripping Tool off these days; and being fair to Kingcrow, there’s enough to make it clear that the band has tried to make the sound their own, including a nicely widdly solo and some odd electronic sounds. On the whole, it’s as much prog rock as prog metal; despite the opening chugginess of Right Before and other moments, the band seems more interested in melody than metal. Which is fair enough, and given the focus makes In Crescendo all the stronger. The band likes to allow the music space to breathe, meaning that although you do get the aforementioned keyboard solos here and there, you also get lush segments like the lazy guitar that opens Morning Rain and builds into an effectively atmospheric instrumental. Elsewhere, This Ain’t Another Love Song starts with an impressively heartfelt vocal and acoustic guitar section, which stays effective and infectious when the guitars kick in and the band briefly turns Opeth-y, while The Hatch starts softer and focused on electronic effects and orchestration, building up to a heavier section like something from a recent Dream Theater album, complete with maddeningly catchy chorus. And really, if the band has one massive strength, it’s that the songwriting is terrific. Hooks are frequent, well woven-in amidst the prog flourishes making the songs easy to remember and come back to. Even if you note the band’s obvious influences, you’ll be enjoying the album too much to care, which takes In Crescendo from being a pretty good album into nearly a great one. Nearly, as it still gets dragged down here and there by moments like the phone message on the dull The Glass Fortress, which show that Kingcrow is up there with Dream Theater when it comes to making daft decisions… Fortunately, the guitar worship on Summer of ’97 makes up for it, and the closing title track is an eleven-minute epic with some perfectly-placed piano. All in all, progheads should definitely be checking In Crescendo out, an album that genuinely is more than the sum of its parts.